Back in 2016, my first year at UC, I signed up to be a Class Rep. At the same time I was asked if I wanted to sign up for CCR. As I found out more about CCR I thought it seemed like a good way to show the additional things I’ve done and skills I’ve learned while studying. And I was signing up to be a Class Rep anyway so I thought I might as well get recognition for it. The Class Rep role can vary depending on the class. Basically if students have any problems or issues, or feedback for the lecturer – for example they can’t follow what the lecturer is saying or there’s something the lecturer has missed out – then they can come and talk to me. I can raise their concerns with the lecturer and then go back to the students on the outcome. Usually if one student is saying something’s happening, there’ll be a whole lot of other students thinking exactly the same thing. The role, which I also did in second and third year, has definitely helped me to build strong communication skills and adapt my communication style when needed. When I’m talking to other students in my class I try to be more approachable and friendly, whereas when I’m approaching lecturers and heads of departments with feedback I’ve got to be more professional. I’ve got to know the lecturers quite well through the process and have formed good connections with them. Just being able to talk to different people from different backgrounds, I’ve probably become more confident as a person. I definitely didn’t used to be as open with other people, but now I can easily go up and talk to someone. I’ve also been involved with the Entre $85k Start-Up Challenge, which has taught me a lot about innovation, thinking outside of the box and being more adaptable and flexible. A few of us had an idea from a course we did last year to develop an app for students called ‘Study With Me’. We put that forward and have recently made it into the top 10 ventures. We’ve talked to lots of business people and mentors, and have made connections and learned to network. The mentoring sessions have been really useful for building knowledge and skills that are really hard to get otherwise. You learn about how to take an idea and start your own business, market validation and things like that. It’s something you don’t learn in the classroom – it’s sort of like getting the real world experience before you get to the real world. There’s so many opportunities that you can take up UC. Doing extra activities – like being a Class Rep, doing the Entre $85k Start-Up Challenge, or being involved in a club – they all teach you skills you can use long-term. The CCR recognises your involvement in these activities and everything you’ve done is summed up and recorded in one place, which is quite useful when it comes to applying for a job. 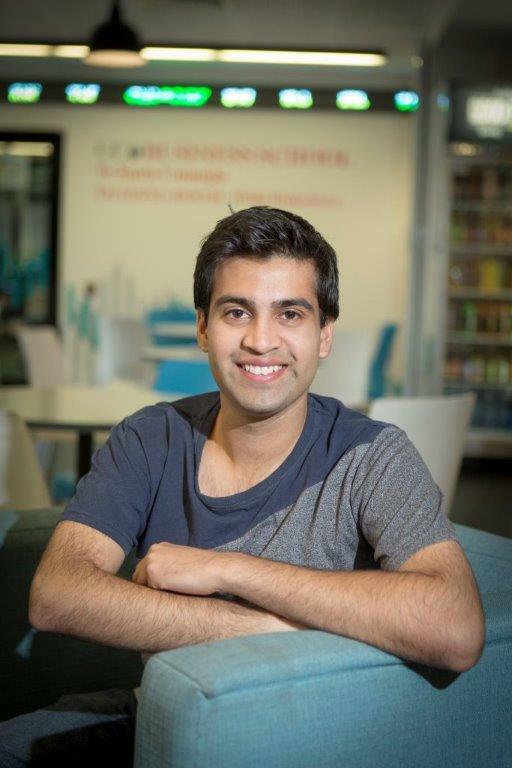 Above: Bejen has been a Class Rep and participated in the Entre $85k Start-Up Challenge while studying commerce at UC.